Solo: A Star Wars Story is now fully out on home video, which means we are now able analyze (and over-analyze) the film further with unlimited repeat viewings. As of recently, many have pointed out the vast amount of inspirations Solo took from various cinematic classics, including some previous Star Wars films. Solo co-writer Jon Kasdan touched on several of the film's very intentional references to other films in a recent Twitter thread, and now a few fans have also got in on the discussion. In addition, Michelle Buchman from Nerdist went into greater detail in a recent article she put together which draws comparisons to various films, including The Outsiders (1983), Bullitt (1968), and The Wild Bunch (1969), as well as several Lucasfilm productions such as American Graffiti (1973), Willow (1988), and Indiana Jones and the Temple of Doom (1984). The entire article is a great read and I highly recommend heading over to Nerdist to check it out! 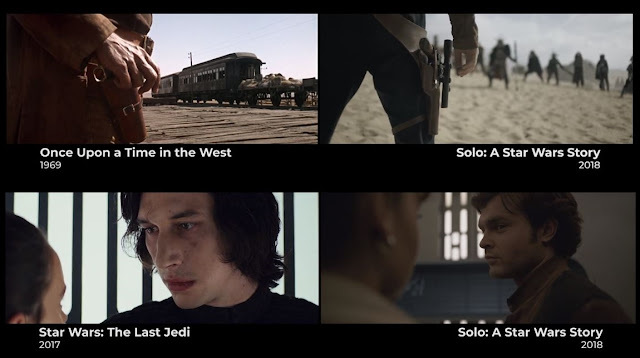 Furthermore, J. Patrick Stublen created a great video which expertly draws direct visuals comparisons from Solo to various of the aforementioned films and others.. In addition, he also brings attention to Solo's mirroring of scenes in other Star Wars films, such as The Phantom Menace, Return Of The Jedi, The Last Jedi, and more.